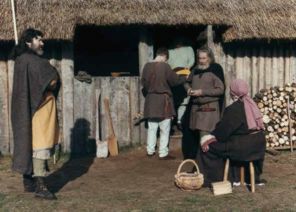 The Anglo-Saxon community in England was basically a rural one, where primarily all classes of society lived on the land. At the top of the social system was the royal house. This consisted of the king and princes (æðelings), who claimed a common ancestry with the king; they had special privileges and responsibilities which included military service and command in the field. By the middle of the ninth century the royal family of Wessex was universally recognised as the English royal family and held a hereditary right to rule. Succession to the throne was not guaranteed as the witan, or council of leaders, had the right to choose the best successor from the members of the royal house. Below the king were the eoldermen, the ruling nobility. 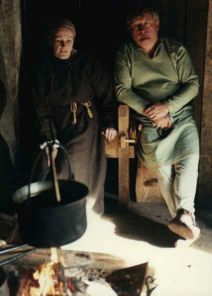 The eolderman was the king's 'viceroy' in a shire, responsible for administration and justice, for calling out the fyrd and leading its forces in the field. The office was not hereditary, but it became usual in the tenth century to choose eoldermen from a few outstanding families. The same eoldormanry frequently remained in one family for more than one generation. 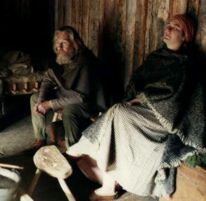 By the early 11th century the term eolderman began to be replaced with eorl, possibly influenced by the Danish 'Jarl'. In the second half of the 10th century the title became more important, an eorl now governing several shires. æðelings, eorls, bishops and archbishops formed the high witan. The next class down the social ladder was the ðegn (thane). Good service by a ðegn could result not only in rich gifts but sometimes in the granting of lands and, on rare occasions, elevation to eorl or eolderman. The eoldermen were all high ranking ðegns. 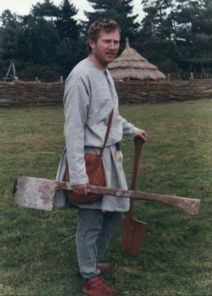 Ðegns formed the backbone of the Anglo-Saxon army. Most ðegns were the 'king's ðegns'. These were the ðegns whose lord was the king himself, as opposed to one of the richer ðegns or eoldermen. They held their lands from the king and could lose them (and sometimes their lives) if they did not answer the king's summons. Their service to the king was performed on a rota and they would accompany him everywhere, both as bodyguards and lesser officials. Ðegns were primarily warriors whose duty was to carry out the 'common burdens' of service in the fyrd, overseeing fortress work and bridge building. A ðegn's status as a warrior is confirmed by the interchangeable use of the word 'ðegn' and 'milites' in contemporary manuscripts depending on whether the text was in English or Latin. The 'cynges ðegn' is usually referred to as a 'milites regis' in the latin texts. A ðegn's wereguild (blood-price) was set nominally at 1200 shillings. Below the ðegns were the ceorls, freemen, farmers and independent landed householders who formed the mainstay of the Saxon kingdom, based as it was on a rural economy. The term free in an Anglo-Saxon context can be misleading, since there were many degrees of freedom. Ceorls were 'folcfry' (folk-free), that is, free in the eyes of the community. They enjoyed weregilds and had the right to seek compensations for other free kinsmen and kinswomen. They were allowed to bear arms and be considered 'fyrd worthy' and 'moot worthy'. This meant they were considered worthy to serve in the fyrd and take part in folk meetings. They did not have the same degree of freedom as ðegns or eoldermen. A ceorl's wereguild was set nominally at 200 shillings, one sixth that of a ðegn. There were three main classes of ceorl, although the dividing line between the classes was indistinct. First were the geneatas, the peasant aristocracy who paid rent to their overlord. geneat originally meant companion, implying that the class originated from the lord's household, often receiving land as a gift. The geneat's duty was also recorded in the same document as the ðegn's law, kotsetla's duty and gebur's duty. Second were the kotsetla, who paid no rent but had to perform numerous duties for their overlords. Third were the gebur, who were totally dependant on their lord. The gebur's life was dominated by the labour services owed to his lord. It is probable that the gebur class started out by giving their land to a ðegn in return for protection from raiding parties. His elder brother examines his new shield whilst his Grandfather takes his neighbour to set some traps. He could not, however, rise to be an eorl. 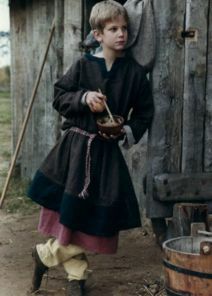 Ðeow were allowed to own property and could earn money in their spare time. If they earned enough they could even buy their freedom, although slaves were sometimes freed by their owners 'for the good of their souls,' often on their owners deathbed as a manumission. Sometimes, when times were particularly hard, people sold themselves into slavery to ensure they were provisioned, and thus survived. When looking at Anglo-Saxon social organisation it is important to describe the geographical division of Saxon Britain. The basic unit of land was the hide. This is usually described as enough land to support one family, however the actual size of the hide seems to have varied considerably from estate to estate - estimated at anything from 40 acres to 4 square miles (120 acres seems to be an 'average' hide). More usual (and more evenly supported from contemporary sources) is a unit of land worth approximately £1. For the purpose of assessment of tax and military service, hides were grouped together in units called 'hundreds', comprised of approximately 100 hides. In charge of the hundred was the 'hundred eolder', and each shire contained many hundreds. Last updated 31 March, 2003. Article by Ben Levick 1990.